4. What do Power Rangers and Stomp Rockets have in common? They were both popular in the 90’s and they both shot up quickly followed by an inevitable fall back down to Earth. 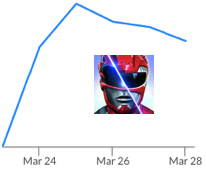 Power Rangers: Legacy Wars launched with hype from the movie (more than 2M downloads) but nostalgia only lasts so long.